Pochero or puchero is a Filipino dish (or so we claim) that is deeply-rooted from the Spaniards. It's a meat dish, tomato-based with several kinds of vegetables and 1 kind of fruit, the plantains. In the Philippines, cooking pochero is typical during large gatherings or special occasions. This is my version of the pochero dish. There is no pork and beans nor garbanzos in the ingredients. I focused on the flavors of the sweet plantains, tangy tomato sauce and the broth from the pork. 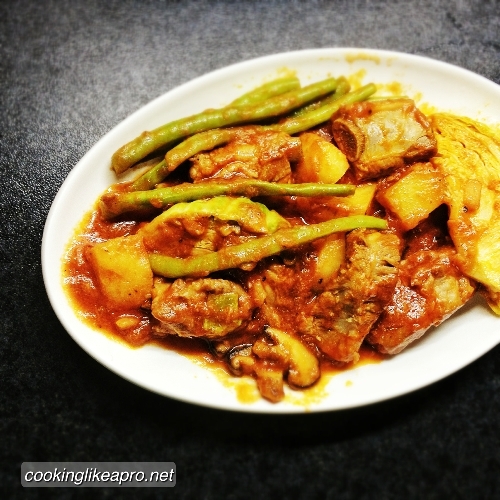 If you try cooking pochero, you'd notice that it is more like cooking pork nilaga with the tomato sauce. Seriously! Here's my pochero with spare ribs recipe. Put the spare ribs, garlic, onions and salt in a crock pot. Allow to boil until the spare ribs are soft and tender. This may take 30-45 minutes under medium to high heat. Add the plantains when the pot starts to boil. Meanwhile, put the achiote seeds in hot water. Rub them with hands to bleed its rich color. Set aside the pork when soft and ready. In a wok or a deep pan, saute' garlic in hot oil. Sprinkle with potatoes freshly ground black pepper. Stir well until the potatoes change to a vibrant yellow. Add the mushrooms. Stir well. Add the cooked pork ribs and its broth; as well as the achiote water. Mind not to include the seeds. Put in the tomato sauce. Cover and let it simmer for another 20 minutes under low to medium heat. When the dish comes together, put the beans and cabbage on top of the dish. Do not stir. Cover once more and let it sit for another 10 minutes. For a feisty pochero, season the dish with cayenne or chili powder. Adjust the taste for the last time with fish sauce. Turn off the heat; but do not remove the cover. The residual heat should cook the vegetables well. This is my take on pochero. I used ripe bananas or plantains while others use unripe ones. Ripe bananas easily give this dish its sweet flavors. Hence, no sugar nor pork and beans necessary. Also, pochero is usually cooked with bok choy; and with no mushrooms. Add or delete them, according to your preference. As far as how my pochero goes, it's one of my cooking wins.